Jesse Lindgard and Dele Alli could very easily be Liverpool players right now. And we’ve truly messed up in our pursuit of the latter. Lindgard, Manchester United’s young winger and recent recipient of an England call-up, has claimed he turned us down for our rivals as a teenager. At 22-years-old, Lindgard’s scored just one Premier League goal. He’s showed promise this season, but doesn’t have the pedigree to develop into a truly elite attacker. Roy Hodgson jumped on the Twitter bandwagon by selecting him for the England squad, and in truth, we’d much prefer a 19-year-old Jordon Ibe. While Liverpool’s self proclaimed ‘transfer committee’ have received incessant media wallopings for money wasted on Mario Balotelli, Dejan Lovren, Lazar Markovic et al, it’s their inability to open the pursestrings for young Liverpool fan Dele Alli that might prove most costly. We’ve missed a serious trick in failing to secure the now Tottenham midfielder – and the teenager looks like he’ll continue reminding us of the transfer blunder. 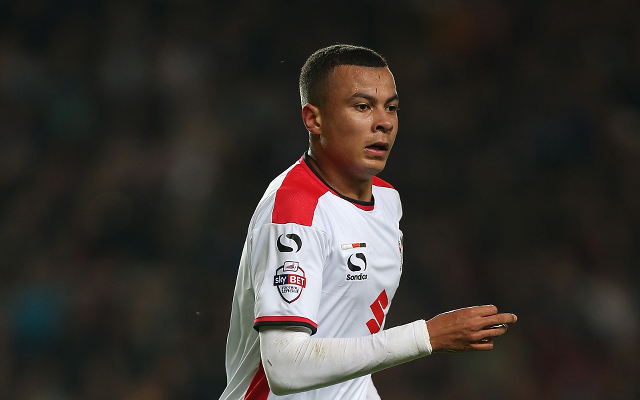 The former MK Dons starlet was always on our radar, however. Aged 18, Alli finished last campaign with 16 goals in League One, starting in central midfield. His talent was so obvious that his signing should have been considered a no-brainer rather than a risk. Now though, Spurs have the natural English heir to our legendary former captain. They spent £5m on him in January 2015. About half what we chucked on Divock Origi six months previous. In just 11 Premier League appearances, Alli has showed everybody that he’s undoubtedly ‘got it’. He’s special. Along with Raheem Sterling, a wonderkid we let slip through our grasp this summer in different circumstances, Alli is England’s most talented youngster. He’s powerful beyond his years but matches it with balance and composure that makes him superbly comfortable on the ball. Ali works hard, but it’s his confidence in the opposition half that separates him from others his age. He can pass creatively with either foot, shoot from range and arrive late in the box to score goals. Remind you of anyone? His goal last night for England versus France will propel him to stardom, but anyone who’s watched him so far this term for Spurs will tell you that kind of performance was expected. According to WhoScored, only six teenagers in the whole of Europe have outperformed him in 2015/16. It’s not like we didn’t try to sign him either, as the player himself confirmed, the Echo reported. “At the time I didn’t feel it was the right move personally, and I wanted to stay at MK Dons a bit longer to get some more first-team experience,” Alli said about rejecting us and signing for Tottenham. What’s strangest about these quotes is that when Tottenham signed Alli in January, they loaned him back to MK Dons for the rest of last season – maximising the game time he claimed he was scared of losing. Could Liverpool, the club of his dreams, not have secured a similar arrangement…? Brendan Rodgers’ biggest detractors will also highlight Alli’s comments about wanting to work with Maurcio Pochettino. We’ll never know if he’d have turned down Jurgen Klopp’s Liverpool. Hindsight of course is a wonderful thing, and there’ll be hundreds of young players we considered that never made it at the highest level. But in Alli, there’s a sense that it was just too obvious. Any half capable scout witnessing his 16 league goals from central midfield last campaign could’ve seen his otherworldly potential. And the fact he was a Liverpool fan and available for £5m should’ve smoothed an Anfield transfer. As it is, we’ll have to envy his progression from afar. In Emre Can, we have a similarly physical but more flustered talent, and it’s in the German’s basket we’ll put our eggs for now.